While the blog has reported some off-planet developments in the study of giant gas clouds ionized by active nuclei (voorwerpjes), we also have some news back here on the third rock from the Sun. 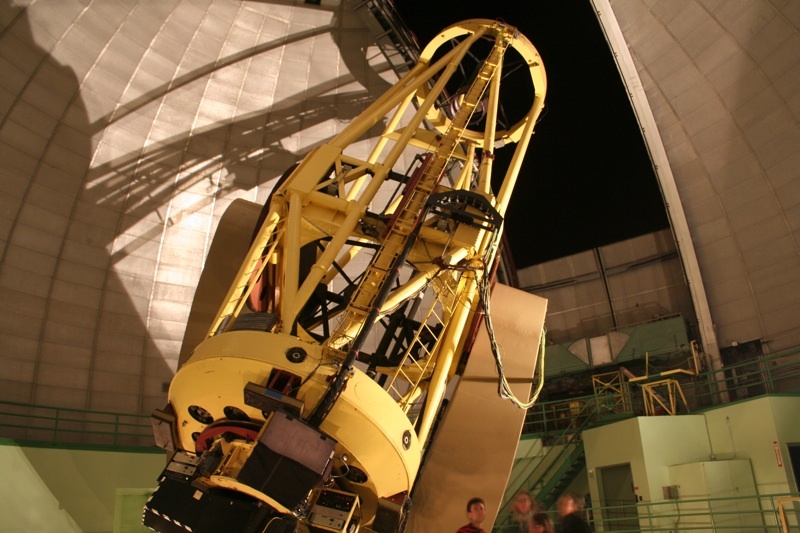 Despite our expectations from the weather forecasts, a bit more than half the observing time last week at Lick Observatory’s 3-meter Shane telescope was good, so we could have a look at 13 candidates. Some of these turned out to have gas shining in such small regions that it’s not very interesting for our purposes (I mean, less than 10,000 light-years? Really? ), and in some cases the features that gave interesting colors in the SDSS composites were due to star formation. But we did add three new giant clouds to our set. SDSS J100507.88+283038.5 has a type 2 Seyfert nucleus. Its SDSS image showed a very suspicious blue wedge pointing eastward. The spectrum confirmed that this is high-ionization gas which must be seeing a powerful AGN; we spent 2.5 hours collecting data with the spectrograph slit in two different orientations. Finally, we come to SDSS J095559.34+395438.9. This may yet prove to be the most interesting of the three. Our spectrum shows a weak Seyfert 2 nucleus there was no SDSS spectrum for this member of the interacting pair). Until reduction of the data is complete, we’re not sure that the gas shows the characteristic He II emission showing that it sees an AGN; if so, this would be another rare case of finding an AGN through extended gas. 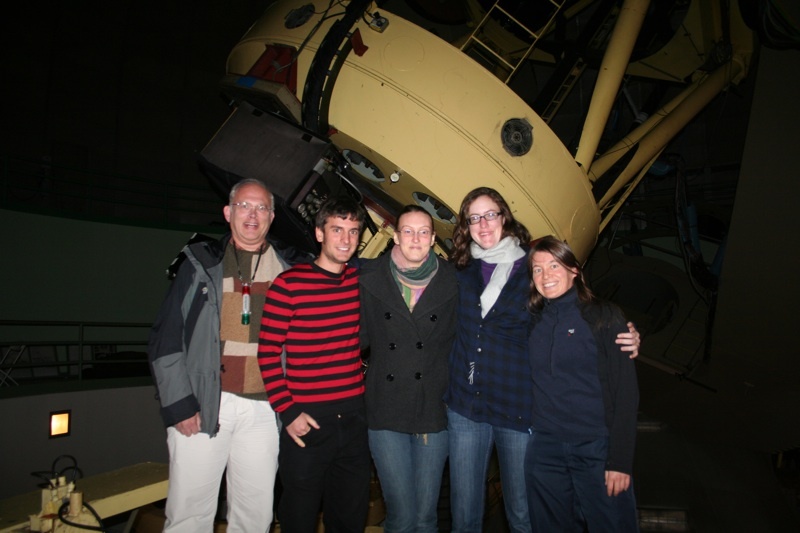 On the last night, we lined all the observers up on a service platform in front of the telescope for a team picture: from left, that’s me (the only one not from the University of California, Santa Barbara); grad students Alessandro Sonnenfeld, Anna Pancoast, and Anna Nierenberg; and Vardha Bennert. Fortunately for my fading sanity in the small hours of the morning, Anna and Anna are pronounced differently. We have these new results in time to fold them in to the poster presentation being prepared by Drew Chojnowski for the next meeting of the American Astronomical Society a month from now in Seattle. There will also be some additional presentations there that will greatly interest Zoo participants; we hope to have exact dates and times in the next day or two. Wonderful! Thanks for the pictures and all your hard work.